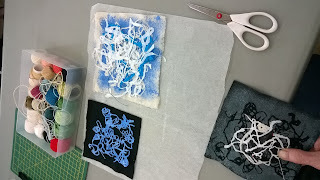 Today I was going to demonstrate a bookbinding technique but unfortunately I hadn't finished embroidering the book cover so I have had to defer that to next month. The embroidery is now finished but I have to mount it onto board and get all the other bits and pieces done. The book is going to hold lots of patterns and designs that I have traced off so every other page will have a pocket to hold these. People still had work to do and Ann was recycling her Bomb Craters from our 'Warriors' exhibition and turning them into shells and pebbles. Caroline was using her new Markel Sticks (she has been to Art Van Go) and making some lovely pages of colour to go into a book. Roma has made her own book of coloured pages and was putting that together. We are now all waiting for Spring and some warmer weather to inspire us. Christina had been on the seafront and taken photographs of lobster pots and fishing nets and was recreating this in these designs. 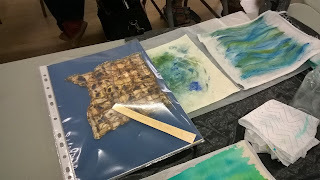 This is Carolyn's markel and paint papers and some tyvek she has been working with. 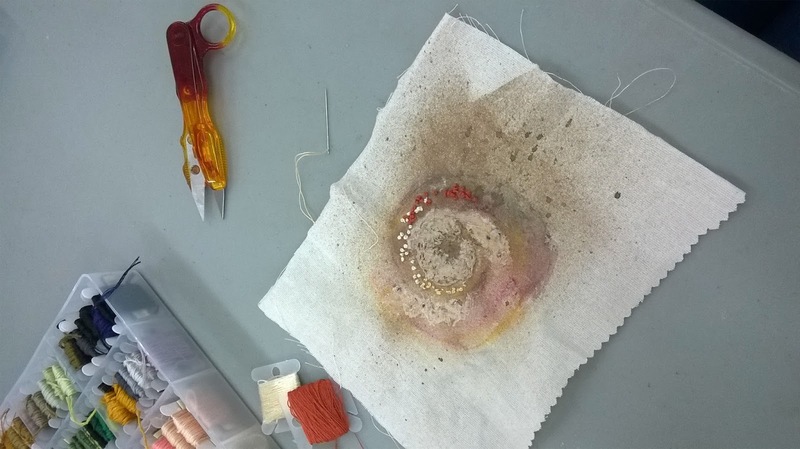 Cath has been stitching ammonites.